University of Chicago Press, 9780226287058, 1146pp. In the seven years since the previous edition debuted, we have seen an extraordinary evolution in the way we create and share knowledge. This seventeenth edition of The Chicago Manual of Style has been prepared with an eye toward how we find, create, and cite information that readers are as likely to access from their pockets as from a bookshelf. It offers updated guidelines on electronic workflows and publication formats, tools for PDF annotation and citation management, web accessibility standards, and effective use of metadata, abstracts, and keywords. It recognizes the needs of those who are self-publishing or following open access or Creative Commons publishing models. The citation chapters reflect the ever-expanding universe of electronic sources—including social media posts and comments, private messages, and app content—and also offer updated guidelines on such issues as DOIs, time stamps, and e-book locators. This edition continues to reflect expert insights gathered from Chicago’s own staff and from an advisory board of publishing experts from across the profession. It also includes suggestions inspired by emails, calls, and even tweets from readers. No matter how much the means of communication change, The Chicago Manual of Style remains the ultimate resource for those who care about getting the details right. 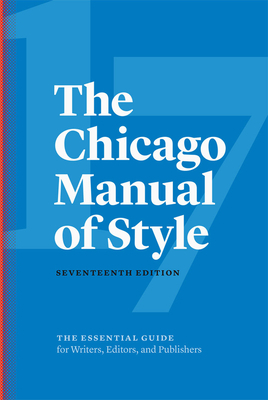 “The Chicago Manual of Style is the essential tool—significantly larger and much more broadly based compared to particular discipline-centric styles—that has (since 1906) guided editors, publishers, copy editors, and proofreaders, and continues to support the scholarship and writing of serious researchers in all fields of study." “A magnificent piece of work."